Executive producer Bruce Timm introduces this latest trailer for the upcoming 'Justice League: Gods and Monsters Chronicles' that will run on Machinima beginning June 8th. The three 7-minute shorts serve as an introduction into this alternate universe where Batman, Superman and Wonder Woman are much darker with completely different origin stories. 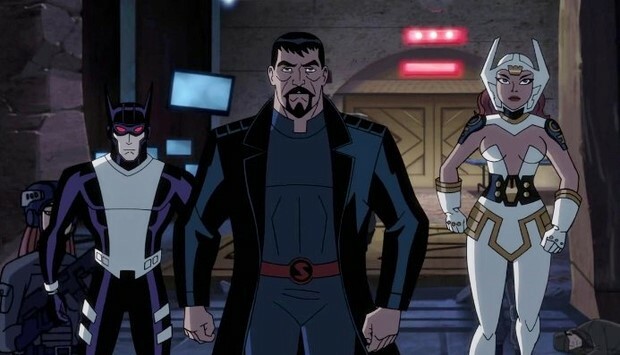 The full-length film, 'Justice League: Gods and Monsters,' doesn't arrive until July, but Machinima's venture with Warner Bros. and DC Entertainment has already secured a second season, inspired a Digital First comic book series and a toy line. Take a look at the newest trailer now with more Harley Quinn. Animated DC Entertainment Gods and Monsters Harley Quinn Justice League Machinima trailer video Warner Bros.
Labels: Animated DC Entertainment Gods and Monsters Harley Quinn Justice League Machinima trailer video Warner Bros.